When I see American movies,I always see a dream catcher hanging from a tree in the movie. Now,there is an important problem, what are dream catchers? Dream catchers are usually made from wooden hoops that are about three anda half inches in diameter. The hoops were originally made from willow branches.The inside of the hoop is strung in a spider web-like design with twine or sinew.The webbing was originally made from plant fibers or sinew string that had beendyed red. One or more feathers was always hung from the netting. The feather isa symbol for breath or air. Dream catcher for sale today, however, dream catchers are much more American than Native American, often oversized and made of cheap plastic materials. Many Native Americans still consider the dreamcatcher to be a symbol of unity and identification among the many Indian Nations and First Nations cultures. 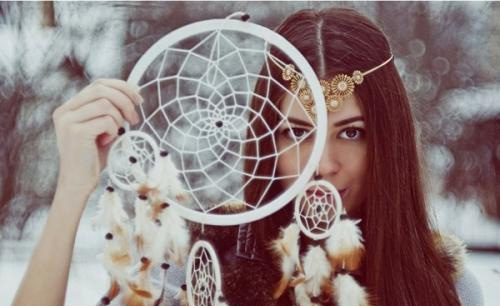 Still, many other Native Americans have come to see dream catchers as an symbol of cultural appropriation, over-commercialized and offensively misappropriated and misused by non-Natives. So, there is another problem, where to buy dream catchers? I can see dream catchers in a souvenir shop.The shape of the dreamcatcher is a circle because it represents the circle of life and how forces like the sun and moon travel each day and night across the sky. Have you ever had dreams that frightened you? Have you ever had dreams that you enjoyed? Native Americans believe dreams are important. 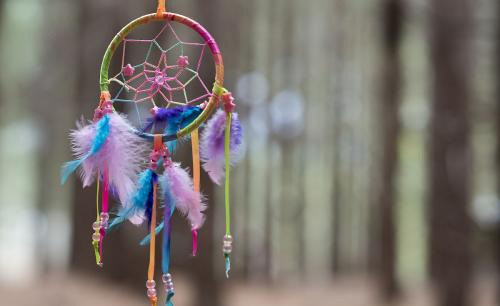 Dreams are said to play an important role in Native American spiritual and religious beliefs.Native Americans believe dreams come from the spirit world. 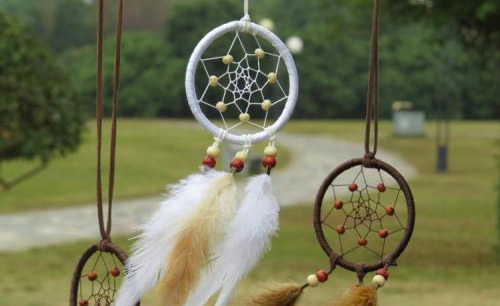 Native American dreamcatcher is said to have originated with the Ojibwa/Chippewa tribe. It was created to catchand separate the good dreams from the bad. 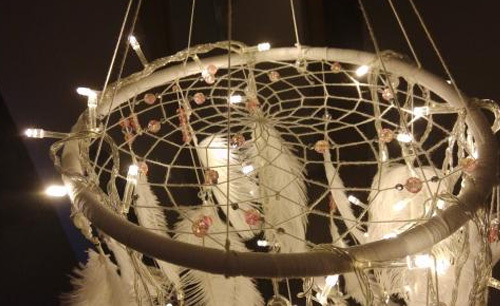 The dream catcher web catches the bad dreams during the night and dispose of them when the day comes. As for the good dreams, the feathers act as a fluffy, pillow-like ladder that allows them to gently descend upon the sleeping person undisturbed. There is some contention when it comes to the meaning of the beads that often decorate the dreamcatcher. According to some American Indians, the beads symbolize the spider—the web weaver itself. Others believe the beads symbolize the good dreams that could not pass through the web, immortalized in the form of sacred charms. Authentic native American dream catchers were originally created by American Indians, dreamcatchers today come in a variety of different sizes and styles. They usually consist of a small wooden hoop covered in a net or web of natural fibers, with meaningful sacred items like feathers and beads attached, hanging down from the bottom of the hoop. 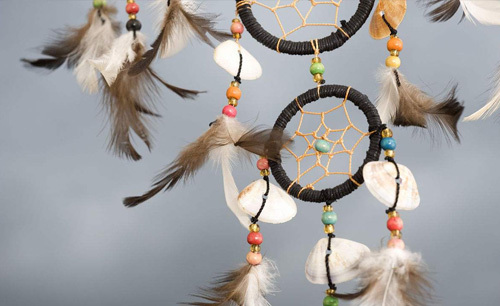 Real authentic, traditional dream catchers are handmade and crafted only from all natural materials, measuring just a few small inches across in size. The hoops are usually constructed of a bent Red Willow branch covered in stretched sinews. Wrapping the frame in leather is another common finishing touch for "real" dream catchers. There are many Native American legends about the origins of the dream catcher.Ancient legends about the history and origin of the dreamcatcher exist among several Native American tribes, but chiefly through the Ojibwe and Lakota nations. While many cultures find spiders to be creepy crawlers, the Ojibwe people found them to be a symbol of protection and comfort. In one version Asibikaashi, or Spider Woman, was its creator. The legend says that at one time the Ojibwa people lived together in a placecalled Turtle Island. An Ojibwa spirit called Spider Woman took care of her people there. Legend says that she brought the sun to them each morning. Before long, the tribe grew. They soon moved away from the island andbecame "scattered to the four winds." Now there was no way Spider Woman could bring the sun to her people every day, so she spun a web to catch the sun's rays for her scattered people. Later, mothers and grandmothers helped her out by weaving sun catchers. The circular webs were placed above the heads of sleeping children. The sun catchers were said to also chase away bad dreams. Because of this, the webs were eventually to become known as dream catchers. You can make your own dream catcher using some twisted paper for a hoop, string or jute for the webbing,and a feather. 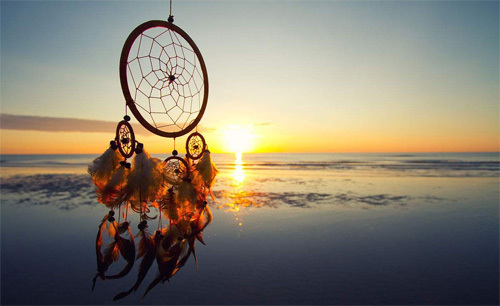 Perhaps your dream catcher will bring you many happy dreams.